I've been wanting to try the Koa Cafe that Nadia had blogged about, but I just never found myself in the area. So I was very excited once Koa Cafe opened in Ka Makana Ali`i! After discovering that Sidewinders are basically like French fries, I decided to order The Snooze Button, which topped Sidewinders with hollandaise sauce, gravy, bacon, Portuguese Sausage, and and Egg. 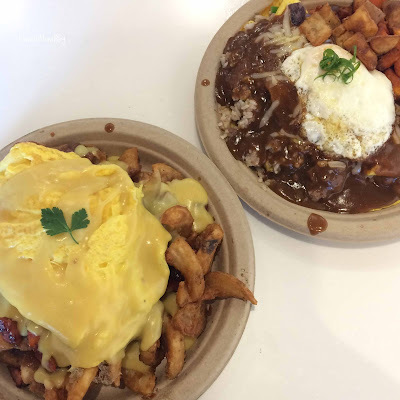 I have a love for French fries + gravy, so this was like the ultimate breakfast for me. It was such a gigantic serving!! It was so delicious! Easily one of the best breakfasts I've had on Oahu in a long time. My husband opted for the Loco Moco Omelette, which the employee at the register said was one of their top sellers. 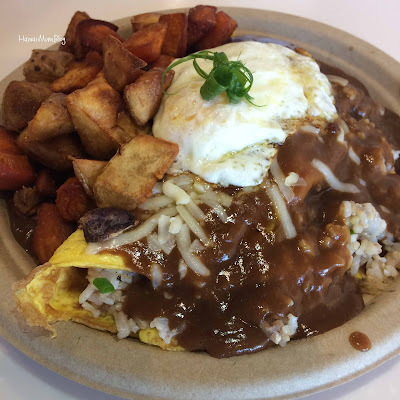 The dish consisted of hapa rice, hamburger, gravy, sunny side egg, and potato medley. He thought it was great, but was a bit disappointed with how little hamburger there was. Service was friendly, and after a while the restaurant got pretty crowded (we were there around 8:30am on a weekday). There are many other dishes on the menu that are so tempting, but it'll be difficult for me to stray from The Snooze Button!